I too get that feeling of dread sometimes. As if when something good happens that means something bad is going to happen to cancel out that good feeling. By frame two, I let out a big, “Awwwww!” After having the message hit so close to home. This is good, Clay. Light-hearted & humorous while nailing an essential truth; not being able to enjoy the good stuff. It isn’t a conscious decision, you just feel bad. Hell, in a lot of ways this is the toughest part, because if things in your life are going to Shitville, it’s “reasonable” to be depressed and/or it’s easier for others to understand. No one gets it when everything is going your way, but it doesn’t matter and you still feel like crap. But of course logic and reasonableness don’t have any part in it, because it IS a disease. 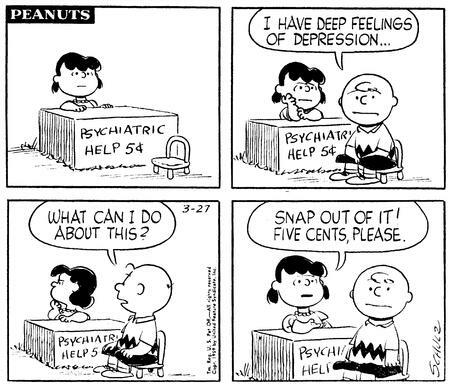 I used to love Peanuts when I was a kid, and reading them again as an adult I find that Schulz had a keen understanding of depression underneath the whimsy of the strip. It’s something I try to aim for as well, but Schulz really was the master. So true. For me, whenever I am in a good mood it feels only temporary. It always goes away at some point. I sometimes wish that I could not have any good days, because the good days make my normal days feel even worse. I really liked the depressed characters comment in the last panel. Just the right amount of humor to lighten a dark topic. Well TBH there are a lot of non-depressed people using that line from the last panel. Damn it. Why does have to be so true. I always think of the sister as Mónica, as it means adviser or counselor and it really seems to fit her role in relation to her brother. I’ve had really good things send me spiraling down hard before. When I finally left my abusive, neglectful parents I hit a bad enough episode to put me in the hospital. Why does the main character in this strip look exactly like my school psychiatrist??? It makes me slightly uneasy?? ?